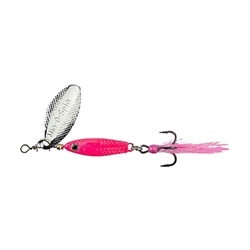 The Johnson Min-O-Spins resemble small fleeing shiners that can be cast and retrieved or trolled for all predatory fish. Their blades and body are designed to spin at the slightest rotation of your reel. Features 3D eyes and lifelike scale pattern to resemble real shiners and have a strong black nickel hook dressed with feathers and flashfoil tinsel.